Depending where you reside, the phrase affordable real estate investing can be laughable. Consider New York City, San Francisco or Chicago; these primary markets have become increasingly impossible for the average real estate investor to acquire and own rental property. However, this problem does not stop the individual investor from wanting to get into real estate investing. You might have gotten the real estate bug from playing Monopoly or the Cash Flow game. Maybe you enjoy watching HGTV, or simply love the concept of putting in the work up front and reaping the long term benefits. Becoming a real estate investor could be thought of as a dream for most, but some are wanting and willing to do whatever it takes to make this goal a reality through owning brick and mortar. Consider investing out of your local market. Just because you don’t live in a market does not mean you should avoid investing there. Purchasing power is critical to the success of a real estate investor. Due to high cost of entry, it is easy to be priced out of most primary markets. Owning rental property and real estate investing in another market may seem difficult or harder to navigate at first. However, when taking a strategic approach to affordable real estate investing, leaving your comfort zone and home market can actually make it easier to reach your financial goals. You may already have to travel for business or work purposes. Apply this concept to your affordable real estate investing strategy. Hopping on a quick flight or driving a few hours can quickly reveal more opportunities which were previously not present. Examples of secondary and tertiary markets include Central Ohio, Tennessee, western Pennsylvania, Texas , Atlanta, Michigan, Maryland, North Carolina, Indiana, Kansas, Las Vegas, Milwaukee, Minnesota, Virginia, South Florida, and St Louis to name a few. It’s important to note, not all markets are created equal. The most appealing secondary and tertiary markets are fundamentally stable. The ideal economy is diversified and not dependent on a sole sector or company. Think Detroit pre-2008. Knowledge-based economies tend to prosper with industries such as in health care, technology and education. In the stock market, blue chip stocks are companies which have solid reputations, are financially solid and dependable with earnings for investors. Think Coca-Cola Co (NYSE: KO), McDonald’s (NYSE: MCD), or General Electric (NYSE: GE) as examples. While blue chips can be the most expensive chips in poker, this is not always the case in the stock market. A glance at the S&P 500 or the Dow 30 reveals that affordably priced stock of quality companies do exist. These rare combinations of affordable pricing and quality assets allow for more purchasing power per dollar without scarifying quality. This is no different in secondary market affordable real estate investments, specifically property priced below $100,000. Quality affordable real estate investment houses can be identified ranging in price from $50,000 to $100,000. The primary focus should be single family homes in most cases rather than condos. Condos do have their benefits however even with a great purchase price, external cost such as uncontrolled association fees and charges can eat away your profits and cash flow. Creating a portfolio of single family homes offers lower risk because they can be purchased with cash or at lower mortgage balances. The smaller down payment means low barriers to entry. When considering the long term fundamentals for evaluating a stock, a company’s present value can be at a price less than its intrinsic value. The stock could be deemed a great investment long term with hopes that the present value and book value eventually meet. This is Warren Buffet’s fundamental philosophy. 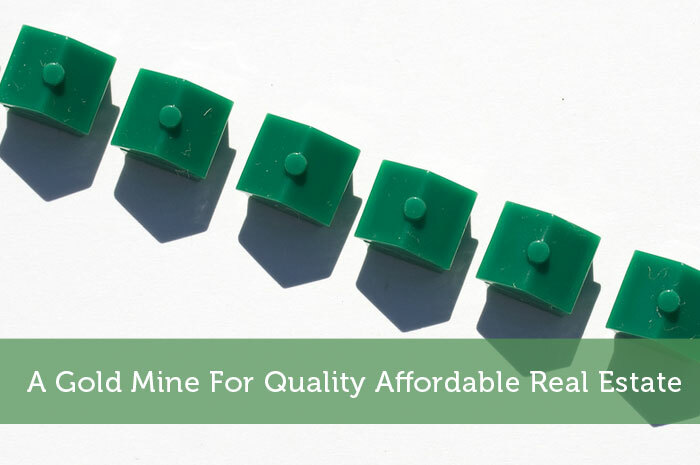 Similarly, secondary markets can be a gold mine for affordable real estate investing. Properties with solid fundamentals can be acquired and accumulate in a long term, buy and hold portfolio. Monthly cash flow is the current and short term benefit while increasing equity and mortgage pay-down are long term benefits. Eventually you’ll want limited monthly expenses and maximum cash flow from your investments. Think of the monthly cash flow as the dividend payment from a stock. In order to maximize the yield, expenses must be minimized. In the world of increasing competition and globalization, American cities are strapped for resources while managing population increases and economic development. The same goes for investors at every level. You’re competing for the best price, terms, and property available. The old saying location, location, location is critical in real estate investment but can be interpreted in many ways depending on your investment strategy. The reality is that the average investor is not the same as the big money, class A commercial Donald Trumps of the world. Ultimately, strategies need to be different. In highly competitive markets, direct competition isn’t always beneficial for your bottom line. Do yourself a favor and arbitrage your real estate portfolio by investing in quality affordable housing in secondary markets.